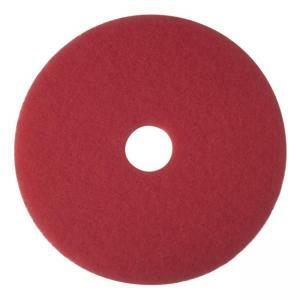 Buffer pads are specially designed for spray buffing. Use with rotary or automatic equipment with low speeds from 175 to 600 RPM. Each pad cleans when damp, and buffs when dry. Pads quickly clean and remove scuff marks while polishing floor to a high gloss. Polyester fiber offers an open, textured, nonwoven construction. Cleaning and polishing abrasive particles are dispersed throughout the nonwoven construction and bonded with a durable adhesive.